Aylsham is a market town in the Broadland district of Norfolk at the end of the navigable part of the River Bure. The parish is relatively large, located south of Blickling and north of Marsham. The village is recorded in the Domesday Book, when two watermills were noted. The land was owned by Gyrth Godwinson, Earl of East Anglia, prior to 1066 and by the King after that date. The town name derives from Old English and means ‘homestead of a man called Aegel’. The medieval history of the town is relatively well known from documentary evidence and the settlement is thought to have been founded in the Saxon period. Relatively little research has, however, been undertaken to investigate the archaeology of the parish. The earliest objects recorded are Mesolithic and include a Mesolithic blade (NHER 13315). There are also several records of Neolithic flint axes (NHER 7390, 7391 and 7392), two from the same field found in consecutive years by the same farm worker (NHER 7391 and 7392). The earliest monument is a possible Late Neolithic or Early Bronze Age hengiform monument (NHER 12772) that can be seen from aerial photographs. The presence of this site in the parish represents a considerable investment of time and effort by those who built it – the site must have been of some importance. Later in the Bronze Age we have some idea of where the population were living. During development of the Aylsham bypass a Late Bronze Age and Early Iron Age settlement (NHER 14940) was excavated. On Tuttington Common a group of Bronze Age barrows (NHER 7545, 6095 and 12773) can be seen. Some of these were excavated in the 1800s when cremated human remains were recovered. These barrows were reused at a later date as parish boundary markers. A Late Bronze Age hoard (NHER 7396) including socketed axes, swords and fragments of other items may have been left by an itinerant smith. There is also evidence for Iron Age and Roman occupation (NHER 7586) in the parish – a site excavated during the 1950s and 1960s at Bolwick Hall is now a scheduled monument. This was an area of Iron Age settlement and later Roman buildings including a kiln. A rare Iron Age brooch (NHER 37124) with La Tene III style decoration was also found in the parish by a metal detectorist. The Roman settlement at Bolwick Hall is not isolated. A Roman rubbish pit (NHER 7588) at the hall itself was discovered in the 1920s and more recent excavations at 8 to 12 Red Lion Street found Roman ditches (NHER 37376) running parallel to the modern road. This suggests the line of the street itself may be Roman, although it is unlikely to have been more than a farm track at this period. Fairly extensive scatters of Roman pottery (NHER 15080, 15078 and 15076), Roman brooches (NHER 11661 and 12772) and Roman coins (NHER 7398, 40419 and 33241) also indicate that there was activity along the Bure Valley above the floodplain. A more unusual find, a Roman raven figurine (NHER 24510), was found on the railway embankment in the town. Saxon evidence is more sparse. The post medieval mill that still stands on the river may be on the site of an earlier Saxon watermill (NHER 7414). The only other monument recorded is a possible Early Saxon metalworking site (NHER 34396). Metal detecting here has recovered a large number of burnt and fragmentary Early Saxon metal objects. Whilst these would normally be considered evidence for the location of an Early Saxon cremation cemetery, the lack of cremation urn pottery recovered makes this unlikely. It is possible that these are evidence for the recycling of the brooches and this is a metalworking site. Other Saxon finds from the parish include Late Saxon brooches (NHER 21581, 29275 and 33095) and a fragment of Late Saxon pottery from the town itself. This may be the earliest evidence for occupation of the town. By the time of the Domesday Book the village was apparently thriving as the manor had twenty villagers and eighty eight smallholders. A market is recorded here prior to 1296 and during the early medieval period Aylsham grew on the back of the linen and canvas industries. St Michael’s Church (NHER 7402) was built in the 14th century, perhaps under the orders of John of Gaunt. There is also evidence for the site of several possible large houses dating to this period. Abbot’s Hall (NHER 7563) was built in 1190 and can now be seen as cropmarks. The site of an unknown manor (NHER 12217) has also been recorded. A later post medieval house now stands on the site. There is also an unidentified medieval moated site (NHER 7403). In the town itself medieval cellars (NHER 34611) remain under some of the later post medieval houses and excavations have identified the foundations of medieval buildings (NHER 37376) in Red Lion Street. A story relates how some medieval copper alloy plaques (NHER 32179) were found nailed to a brasier’s door in the town. They come from a portable Romanesque altar. The later prosperity of Aylsham depended on the growth of the woollen industry and the weaving of worsted cloth. After the Industrial Revolution agriculture took a more prominent role and as communications were improved (for example the cutting of the Bure Navigation Canal (NHER 29856) and the turnpike road from Norwich) the town thrived. A post medieval road and tollhouse (NHER 7486) possibly related to the turnpike can be seen as earthworks. A spa (NHER 12214) was set up in the 17th century and by the 19th century had two wells. The Buttlands (NHER 12213), a medieval archery ground was laid out in 1542 but is now used as a car park. 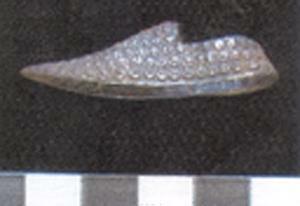 Finds from this period include a rather ornate silver toy shoe (NHER 37441). Many of the brick buildings (NHER 12039, 12216 and 13467) date from the 17th, 18th and 19th centuries. Aylsham Old Hall (NHER 7413) was built in 1689, perhaps as a dower house for Blickling Hall. The Black Boys Hotel (NHER 13466) dates to 1710 and The Orchards (NHER 31591) is 19th century. Like St Michael’s Workhouse (NHER 7416) it is built in Tudor style. Excavations at the St Michael’s Workhouse and later hospital (NHER 40920) demonstrate how it was designed to sit on the edge of the medieval town, with ditches and field systems all around it. The Town Hall (NHER 41169) also dates to the 19th century. 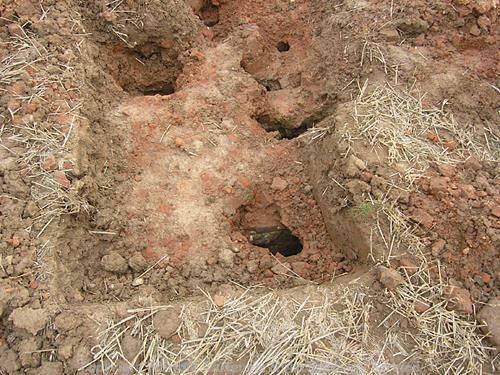 Excavations have also revealed a post medieval brick kiln at Banningham (NHER 40955). A timber framed workshop (NHER 39761) built around 1860 is one of the best preserved buildings of its type in the eastern counties. Since the post medieval period the town has continued to grow. There are several World War Two monuments mostly related to defence including several pillboxes (NHER 32493, 41382 and 32549), an air raid shelter (NHER 31591) and a spigot mortar base (NHER 38028). A Royal Observer Corps site (NHER 33254) is marked on a map at Spa Lane. It is clear that there is a long history of human activity in the Aylsham area. This began back in the Late Neolithic when the hengiform monument was built but continued into the Saxon period when there is the earliest evidence for occupation in the town itself. In the medieval and post medieval periods the market and linen, woollen and agricultural industries flourished. Many of the listed buildings, now protected by English Heritage or owned by the National Trust, were built during this time. The most modern monuments include evidence for World War Two defences. The archaeology of Aylsham continues to be investigated with the most recent excavations taking place in 2004 helping us to understand the development of this market town and the surrounding countryside. Megan Dennis (NLA), 5 October 2005. Archant Regional, 2006. ‘Community: Aylsham’. Available: http://www.edp24.co.uk/Content/Community/Aylsham/asp/history.asp. Accessed 26 January 2006. Aylsham Partnership, 2005. ‘Aylsham History’. Available: http://www.eastspace.net/aylsham/DisplayArticle.asp?ID=3511. Accessed 26 January 2006. Higginbotham, P., 2005. ‘Aylsham Poor Law Union and Workhouse’. Available: http://users.ox.ac.uk/~peter/workhouse/Aylsham/Aylsham.shtml. Accessed 26 January 2006. Norfolk – Norwich, 2005. ‘Aylsham Norfolk’. Available: http://www.norfolk-norwich.com/norfolk/towns/aylsham.php. Accessed 26 January 2006. Poppyland Publishing, 2005. 'Aylsham Norfolk'. Available: http://www.poppyland.co.uk/norfolk/aylsham.htm. Accessed 26 January 2006. Taylor, J. and Smith, L., 2003. ‘Roll of Honour – Norfolk – Aylsham’. Available: http://www.roll-of-honour.com/Norfolk/Aylsham.html. Accessed 26 January 2006.